June is just around the corner and we all know what that means. Yes, it is the most popular month for weddings. Thousands of people will be exchanging vows and starting a new life together, a happy occasion indeed. If you are getting ready for your wedding whether it is in a few days, weeks, or months time, one thing you must not forget to buy are the wedding rings. Believe it or not, the rings are usually the last thing that is bought, and in quite a few cases some persons have forgotten to buy their own altogether, taking into consideration the fact they concentrate mainly on getting things in place for the ceremony and reception. When you are ready to buy your wedding rings, Blue Nile has a wide selection, over 200 in fact, from which you can make your choice. It is less hassling for the bride and groom when they purchase their rings online as they can take their own sweet time to look at everything that is in the store, and not have a salesperson behind them saying that the one they are looking at now is just right for them. 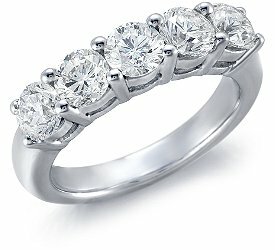 Another great thing about Blue Nile is that you can build your own three stone or five stone ring to your specifications. Just select the round diamonds that you want and you are on your way. For a great selection of wedding rings, great service, and excellent value, Blue Nile is definitely the place to go. They are open everyday, so you can shop at any time of day or night. Get your rings right now to put your mind at ease so that you can focus on the rest of your wedding preparations.